It’s always a pleasure to encounter - and encourage - new ensembles, of which the Park Avenue Chamber Symphony is one. Founded in 1999, the New York-based band - led by Juilliard alumnus David Bernard - has already made a number of recordings. I’m always surprised at the sheer ambition of these fledgling orchestras when it comes to repertoire; it’s one thing to play contemporary works - new or little known - but it takes some courage to choose acknowledged masterpieces, in this case symphonies by Schubert, Mendelssohn and Mahler. Already over-represented in the ever-growing catalogue these staples have attracted the finest orchestras and conductors past and present, and we all have our unwavering favourites among them. Given such formidable competition, one might wonder if it’s brave or foolhardy to aspire to Olympus, let alone climb it. Occasionally such hubris is rewarded, but all too often it comes to grief in the foothills. The Mahler, with its weight, sweep and wealth of fine detail, is particularly ambitious for a band such as this. 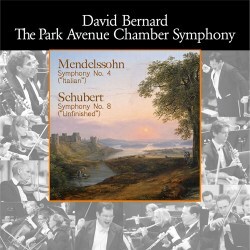 What of the Mendelssohn and Schubert? The warmth and joie de vivre that suffuses Mendelssohn’s ‘Italian’ symphony makes it one of his most spontaneous creations, its transparent textures and infectious rhythms a guaranteed pick-me-up. This PACS performance is certainly light on its feet, but listening to the sprightly first movement one might be tempted to say it’s lightweight too. The bass-shy recording, while quite detailed, tends to reinforce this impression. Ensemble is reasonably disciplined, although those recurrent rhythms aren’t as clearly articulated as they might be. As for Bernard he animates the music well enough, but for all its brio this ‘Italian’ is woefully short on light and shade. The result is a reading whose musical and emotional topography is somewhat flattened. The string passage that opens the Andante emphasises the undernourished sound of this orchestra. In mitigation the lower string tunes are warmly caught and tellingly phrased. It’s only later that a curious lack of incident and a faltering pace cause one’s attention to wander. The third movement is similarly afflicted, and for all its commitment and energy the playing is just too anodyne. Passable for an evening concert in your local church hall perhaps, but invisible on a bigger stage. Yes, the Saltarello does get a spirited outing, but while outlines are easily discerned poor articulation - manifested as a smearing of inner detail - is something of a buzz-kill. There’s enthusiastic applause from what sounds like a fairly small audience before we plunge into the Schubert. The louring strings at the start of the first movement and those pensive pizzicati are nicely done, and Bernard springs the music with a certain style and rare affection. Why, then, does one feel so utterly disengaged? Well, there’s a general lack of weight that’s not just about numbers - particularly noticeable in those bluff, scrawny climaxes - and a dispiriting lack of communion throughout. The ‘Unfinished’, more so than the ‘Italian’, is horribly unforgiving of less-than-top-notch playing, and the absence of that all-important Schubertian line doesn’t help; without either this performance is doomed from the outset. There’s no applause at the end of that one, and the music fades into ‘dead’ air. This isn’t so much a contemplative silence as a crude guillotine wielded by the engineers. It’s so disappointing, especially when there are flashes of loveliness - the woodwind sound especially limpid in the second movement - and one genuinely wishes this maestro and his band had made it even half-way to the summit. At this budget price - the download sells for around £7.50 on Amazon - impecunious buyers will find plenty of top-flight versions of these works at this price or less. 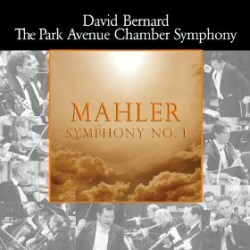 Speaking of summits Mahler’s First Symphony is a strenuous climb for the unfit or unwary, and the tentative, stumbling gait of this Park Avenue performance doesn’t bode well for what lies ahead. As with their Mendelssohn and Schubert the outlines are sketched in, but that’s hardly enough when the all-important detail is missing. The subtleties and nuance of rhythm, shape and colour are all part of the symphony’s ‘density of specification’; sadly, this performance doesn’t even begin to address these vital elements. Moreover, the horn playing is often querulous, progress is fitful and tempi are simply wayward. Yes, there is some charm in this reading - albeit hard to find - but the orchestra’s lack of symphonic weight and breadth means dynamic contrasts are cruelly foreshortened. Tuttis are untidy, familiar sonorities are barely recognisable and the vague soundstage is a real drawback too. Most damning of all, there’s precious little sense of the long, arching span that culminates in a most emphatic, carefully signposted finale. It all sounds so underpowered and unrefined, which is simply fatal in this great symphony. Indeed, these three performances, which show promise in parts, simply don’t measure up the high technical and interpretive standards to which we’ve become accustomed - even from the better student and semi-professional ensembles. Strictly for the orchestra’s friends and devotees.